You’re tasked with achieving two key goals that are often at odds with each other. You recognise the importance of transforming your customer experience and having the best contact centre systems in place. But at the same time, you’re under pressure to keep costs under control. Accomplishing just one can occupy all your attention—how do you manage both? The right technology is important, but the way in which you deploy it will make or break your success. You need to know the pitfalls to avoid, and you need to know the return on investment (ROI), how long it will take to recoup, and what the real total cost of ownership is. We know your customers expect more from you than ever. And when they have got a problem or a question, there are many ways they want to get in touch with you. To stay ahead, you need to meet their expectations and deliver effortless service across every channel. But without the right technology, that can be tricky. And a poor customer experience can have a big impact on your reputation. So what if we could make it easier for your people and for your customers? The biggest challenge for both consumer and B2B companies is to create that single, simple, seamless experience across all channels. The right technology is important, but reducing effort for all involved is the real key. This means unifying multiple contact centre systems and channels and aligning business needs and technologies. Only then can you truly understand customer behaviour and give agents the information they need to do the job. That way you reduce frustration for both, minimise the effort needed to achieve objectives and provide a better experience at a lower cost. Join us live from the studio to hear how we can help you minimise customer effort and transform customer experience to differentiate your brand. Our latest research reveals a major shift in how consumers want to communicate. Whether it’s contact by phone, email, internet self-service, web chat, social media, chatbot or video, our study shows how ‘type’ based messaging channels sit alongside the traditional ‘talk’ channels of phone and face-to-face, rather than replace them. 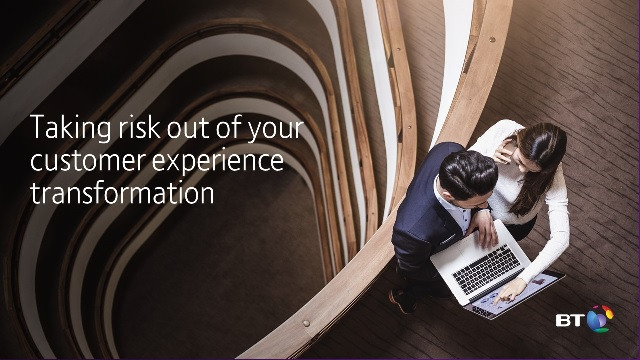 Join Nicola Millard, BT Head of Customer Insight and Futures, as she explores the research and what you need to be doing to ensure you’re designing and delivering the omni-channel experience your customers expect. Even though most customers aren’t familiar with the word ‘omni-channel’, they are well-versed in what it means — moving seamlessly between digital and physical channels. And, according to Dr. Nicola Millard’s latest research, that’s exactly the kind of customer experience they’re looking for. To stay ahead of the competition, retailers need to improve the customer experience. In this video, Dr. Nicola Millard reveals why personalisation is key. Watch how virtualization of Etihad Airways global contact centres is helping set highest quality customer service standards, deliver quantified business results and drive the airline’s future success. Customer experience is the benchmark when choosing between brands. It’s no longer about isolated interactions, but rather an end to end journey in which there are multiple interactions. Customer experience matters to consumers, with 56% saying convenience is more important than price. They want better, more personalised and more complete experiences that surprise and delight them. To meet customers’ expectations you need to be ready for every eventuality.